U.S. District Court Judge Harvey Bartle will hear a motion Friday to unseal government documents and testimony relating to the "12th Juror," who was dismissed during deliberations in the corruption trial for U.S. Rep. Chaka Fattah, right. The "12th Juror" was the lone holdout in eight 11-1 votes to convict the congressman before his dismissal by Bartle. "Juror 12," the holdout who was dismissed in the middle of deliberations in the political corruption trial of U.S. Rep Chaka Fattah, told a federal court clerk that he intended to "hang this jury no matter what," according to court records unsealed Friday. The information could provide legal fodder for appeals that are expected to be filed by Fattah, who was sentenced to 10 years in prison on Monday and will remain free on bond pending the outcome of his appeal. Four co-defendants also face jail time. U.S. District Court Judge Harvey Bartle decided Friday morning to unseal the records in response to a motion filed by lawyers for Philadelphia Media Network. 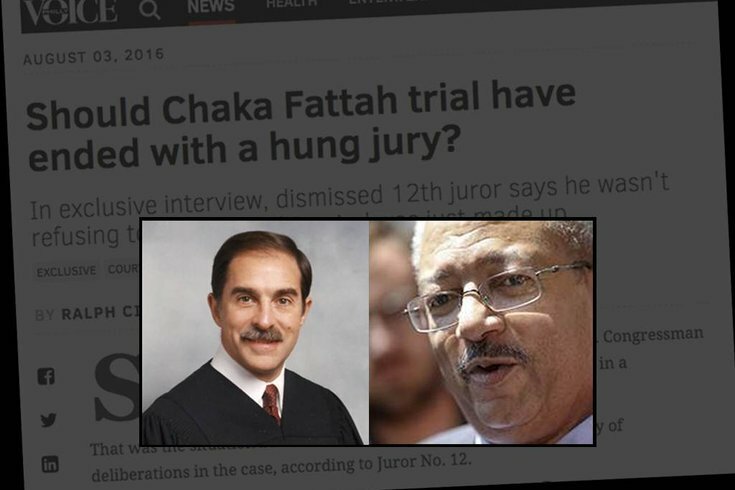 Exclusive: Should Chaka Fattah trial have ended with a hung jury? According to the records, the jury foreperson delivered a note to the court early on the afternoon of June 16, the second day of deliberations, reporting that juror Timothy Miller, 47, of Lancaster County, was not "deliberating in good faith." "We feel that [Juror 12] is argumentative [and] incapable of making decisions. He constantly scream [sic] at all of us." A hearing was held in the judge's chambers with five jurors – Juror 12, the foreperson and three others – and counsel, but the issue went unresolved before court recessed for the day. The next day, another hearing in chambers was held in which the court's deputy clerk testified under oath that Juror 12 told her at the end of the previous days deliberations that "he was going to hang this jury no matter what." Miller was dismissed and an alternate selected to take his place. After three more days of deliberations, the newly constituted panel returned guilty verdicts against all of the defendants on most of the charges. "There have been only approximately four hours of deliberation," Bartle wrote. "There’s no way in the world he could have reviewed and considered all of the evidence in the case and my instructions on the law." "Juror number 12 has delayed, disrupted, impeded, and obstructed the deliberative process and had the intent to do so," the judge continued. "I base that having observed him, based on his words and his demeanor before me. He wants only to have his own voice heard. He has preconceived notions about the case. He has violated his oath as a juror." According to court records, Miller admitted under oath to telling the clerk he intended to hang the jury and then attempted to backtrack on his statements, an effort the court found not to be credible. "Here, there is no doubt that Juror 12 intentionally refused to deliberate when he declared so early in the process that he would hang the jury no matter what," Bartle wrote. "This finding was predicated on the admission of Juror 12 as reported by the court’s deputy clerk. The facts became clear to the court after hearing the credible testimony of the deputy clerk and the less than credible testimony of Juror 12. The demeanor of Juror 12 before the court confirmed the court’s findings." Court records also disputed there was ever a court order barring the parties or their counsel from discussing the circumstances around Miller's dismissal. The juror’s version of what went down behind closed doors was the focus of an exclusive interview in PhillyVoice back in August. On Friday morning, lawyers for Philadelphia Media Network argued that the other side of that story – hidden behind sealed government documents and transcripts – should be made available. Bartle's agreed during a 20-minute hearing Friday morning. Neither the prosecution nor the defense opposed Philadelphia Media's motions to intervene in the case. Ironically, the lawyers cited the PhillyVoice article and a related story on BigTrial.net—two media competitors – to support the motion to intervene. In his interview with PhillyVoice, the Miller, who was not identified by name at the time, said he was the only holdout in eight separate 11-1 votes for conviction as the jury panel deliberated the various charges against Fattah and four co-defendants. The case was built around a 29-count indictment that charged Fattah and his co-defendants with conspiracy, bribery and fraud. The government alleged the congressman played fast and loose with federal grants and other earmarked funds, using them to pay off personal and campaign debts, including $600,000 that was spent on his failed Philadelphia mayoral campaign in 2007. He acknowledged that he had clashed verbally with other jurors, but said he never refused to deliberate. In August, legal experts told PhillyVoice that there is a distinction between a juror being adamant in his or her beliefs as opposed to being obstinate and refusing to deliberate. That appears to be the fundamental question in this dispute. The juror said that was exactly his position. Miller said other members of the panel referred to him as “an idiot” because of his stance during deliberations. He said one member of the panel suggested he had landed on his head a few times while jumping out of airplanes in the Army. “They were talking about getting rid of me right away,” he said.